In Brussels, the European Union condemned Israel's "extra-judicial killing" as illegal and likely to further inflame violence. Israeli security sources said Prime Minister Ariel Sharon personally ordered and monitored the helicopter attack against the paralyzed cleric, whose wheelchair lay smashed in a pool of blood after three missiles exploded. It was the highest-profile assassination of a Palestinian since the April 1988 killing in Tunis of Palestinian commando chief Khalil al-Wazir. At least seven other people died in the Gaza strike and two of Yassin's sons were among 15 wounded. 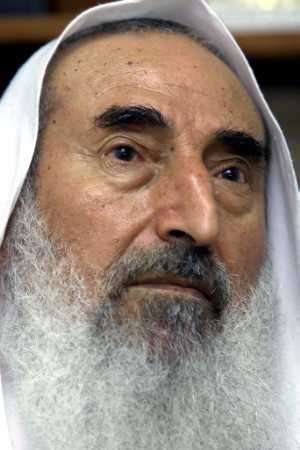 The attack on Yassin as he and his entourage left dawn prayers seemed to be aimed at weakening Hamas to prevent it from claiming victory should Sharon go ahead with a planned unilateral pullout from Gaza. After the first missile hit, a witness told Reuters: "I looked to see where Sheikh Ahmed Yassin was. He was lying on the ground and his wheelchair was destroyed. People there darted left and right. Then another two missiles landed." Another one of Yassin's sons, Mohammed, told Reuters he had remarked to his father about three hours before the attack about an Israeli reconnaissance plane spotted in the sky. Israeli Defense Minister Shaul Mofaz, speaking to reporters, called Yassin "the Palestinian (Osama) bin Laden" and pledged more Israeli attacks on Hamas's top echelon. But a dissenting voice in the Israeli cabinet, Interior Minister Avraham Poraz, said Yassin -- Hamas's spiritual leader -- was not "a ticking bomb" and voiced concern that his death could lead to the loss of many more Israeli lives in suicide attacks. Previous assassinations of Palestinian resistance leaders have triggered waves of suicide bombings that have turned Israeli buses, restaurants and cafes into charred wrecks and deepened violence that has stalled a U.S.-backed peace "road map." Hundreds of thousands of Palestinians poured out their grief in a funeral procession for Yassin and the other dead. While espousing "armed struggle," Yassin's movement also ran a broad welfare network for Palestinians and he was seen by many in the West Bank and Gaza as a heroic symbol of resistance to Israeli occupation. Officials in the Palestinian Authority called Yassin a moderating force in Hamas, an Islamic movement he co-founded in 1987 with encouragement from Israel, which hoped the new group would undercut its long-time enemy, PLO chief Yasser Arafat. "It is a clear message to the world that the Israelis are not ready to sit with the Palestinians for peace," Palestinian Prime Minister Ahmed Quorie told reporters after the killing, which he said "opened the door to chaos." With eyes burning with tears and rage, mourners reached out to touch Yassin's Islamic flag-draped coffin in the biggest public turnout in Gaza since Arafat's triumphant entry in 1994 after interim peace deals with Israel. "Sharon, start preparing your body bags because (Hamas's) Qassam Brigades will put Israeli houses in mourning and make a funeral in every Israeli street," the crowd chanted. In the first sign of revenge within Israel, a Palestinian with an axe hurt three people outside an army base near Tel Aviv, Israeli police said. He was arrested. In scenes reminiscent of the start of a Palestinian uprising that began in September 2000, protests erupted in the West Bank and Gaza Strip. Witnesses said Israeli forces killed a gunman in the Gaza Strip and an 11-year-old during a demonstration in the area. In the West Bank city of Nablus, witnesses said soldiers shot dead a university student-reporter during an anti-Israeli protest. The army said he was a gunman who fired at the troops. The Israeli army sealed off the West Bank and Gaza Strip to stop any Palestinians entering Israel. Mosques called an immediate general strike. Arafat, the Palestinian president, declared three days of mourning. He and his cabinet stood in a moment of silence at the start of an emergency meeting. A senior State Department official urged all sides to remain calm. The United States brands Hamas a terrorist group. Hamas said it believed Washington, where Sharon hopes to win support for go-it-alone steps Palestinians fear could turn into an Israeli land grab in the West Bank, had given the green light for Yassin's assassination. Take Action, sign on to the letter at http://www.cflweb.org/ political action and tell Congress to stop using your tax dollars to support apartheid terrorism. The Israeli lobby AIPAC counts on your ignorance. Iraq, Palestine, Neocons - how all of it ties together can be found in this report entitled "The Israel Lobby and U.S. Foreign Policy". A condensed version can be found here at the London Review of Books. EVERYONE SHOULD SEE THE DOCUMENTARY “TERROR STORM” BY ALEX JONES. It exposes Government sponsored terrorism, False Flag Operations, the Pro-War Zionist Media and The New World Order. Throughout history, criminal elements inside governments have carried out terror attacks and psychological operations (psy-ops) against their own populations as a pretext to enslave them. TerrorStorm reveals how, in the last hundred years, Western leaders have repeatedly murdered their own citizens while posing as their saviors. This powerful documentary explores the mindset of the average brainwashed Westerner. It delves deeply into the systems of control which have been scientifically-crafted to imprison their minds and keep their eyes closed to the realities of the world around them. A Must See Film…TERROR STORM… "The DVD Of The Resistance": Watch Free, Spread The Word! Please help us get Terror Storm to as many people as possible! What is a False Flag? …Committing an atrocious act and then blaming it on another party or nation. The point is to turn public opinion against an entity and have someone else fight your battles for you. Will America demand that Israel surrender its illegal nuclear weapons and other WMDs before it can detonate one in the United States under another False Flag Operation? Note: The mainstream media refuses to address and fairly report on the tragic events in the Holyland which is Palestine, this in spite of the fact that it is the most important issue on the global stage. Resist The Corporate Owned Pro-War Zionist Media’s 24/7 Campaign To Brainwash And Manipulate The American Public. Render Them Irrelevant. Get Your News Uncensored and Unfiltered From Independent Sources. http://www.democracynow.org/index.pl Listen to Amy Goodman’s show everyday… a must. FOX and CNN 24 / 7 propaganda machines are undermining objective media. Take action: Call your cable provider and tell them that they have 30 days to carry the Al Jazeera “English” Channel on “basic cable” and if they refuse to, boycott them by cancelling their service. BOTH REPUBLICAN AND DEMOCRAT PARTIES SUPPORT ISRAELI APARTHEID TERRORISM AND THEIR MEMBERS RECEIVE MONEY FROM AIPAC INFLUENCED PRO WAR PRO ISRAEL PACS. Must reads: Beyond Chutzspah, Finkelstein. A Pretext For War, Bamford. The Ethnic Cleansing of Palestine, Simons. Must see: Rachel - An American Conscience, Barakat. Please copy, e-mail, re-post and distribute this as widely as possible. Also for those without Internet access. Listed below are the 10 latest comments of 206 posted about this article.